Jewelry is like the icing on fashion cake; it adds the finishing touch that makes your look pop! During the month of July I've been featuring a few custom jewelry pieces from Etsy Store; Baubles & Bling by Cynthia. Check out the store for one of a kind pieces that add a little something extra to your summer basics; or start preparing for fall accessorizing now. 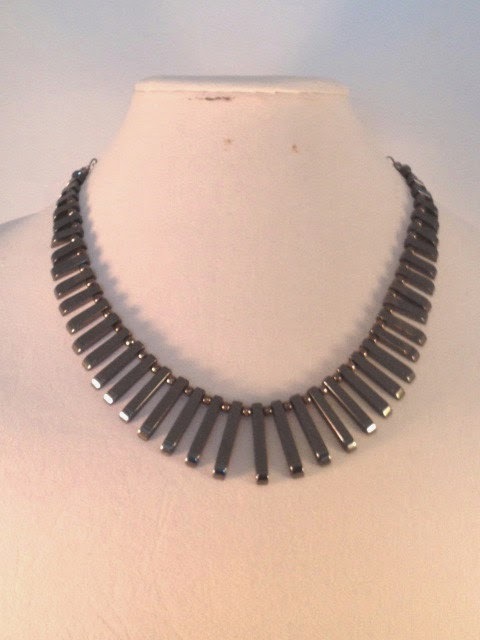 I've partnered with Baubles & Bling by Cynthia to give one of my lucky lovelies their own Natural Hematite Gemstone Statement Necklace! I chose this piece because I believe the neutral colors and design make it a versatile piece that will look great dressed up or down during any season. Sweepstakes will start midnight Monday, July 28, 2014 and end Tuesday, August 5, 2014 at 12 a.m. Winners will be randomly selected. Use the Rafflecopter widget below to enter, and check back next Wednesday, 8/6/2014, to find out if you are the lucky winner. Good luck!